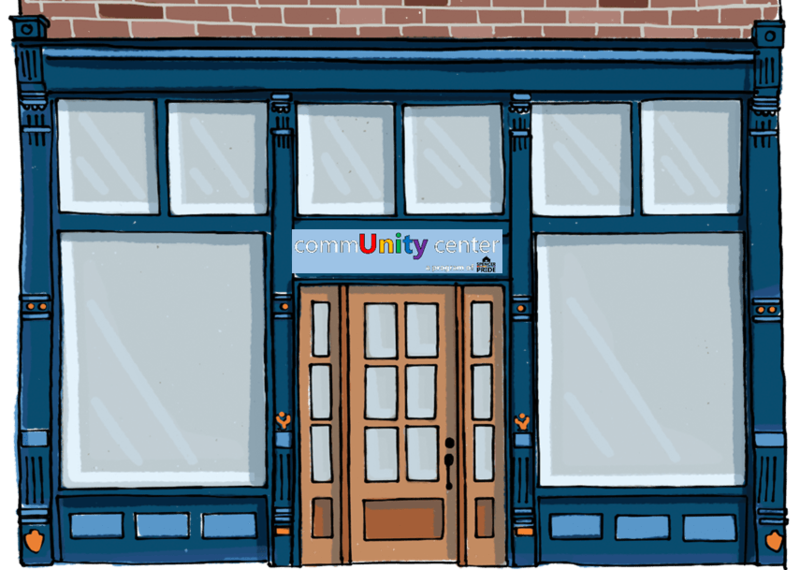 The Unity Shop is the retail space with the commUnity center. It features items made by local artists. There is also a wide variety of vintage resale items for sale. Spencer Pride president Jonathan Balash and the volunteers of Spencer Pride, Inc., are proud to announce the opening of their new commUnity center, now located at 17 E. Franklin Street in Spencer. The center is located in the historic Improved Order of the Red Men (IORM) Lodge Building, which was originally constructed in 1898. “A majority of the demolition and relocation of the retail space was accomplished by our wonderful volunteers,” said Judi Epp, Spencer Pride’s Treasurer. During 2017, Spencer Pride volunteers logged 6,531 hours throughout the various programs run by the organization, including the commUnity center. In January of 2018, volunteers donated 1,114 hours, primarily involving their work on the new building. Volunteers worked to preserve the historic features of the building, while making necessary changes to transform the building into a functioning space for the community. Volunteer work days were scheduled throughout the last couple of months of 2017. The final moving date from the former location Market Street took place on January 28th, 2018. Numerous local contractors were also engaged in the work at the new facility. This was coordinated by Spencer Pride Director & Retail Manager, Jacob Balash. Work will continue on other areas of the building. Phase I, which mostly included the transition of existing operations, is now complete. More Spencer Pride volunteers pose for a photo during the January 28 moving day. In addition to the onsite work at the facility, the Spencer Pride Board of Directors has been working with Springpoint Architects out of Bloomington, Indiana, to conduct a feasibility study on the structure. This study will be used to guide the organization in developing the building. The feasibility study is expected to conclude within the next two weeks. Phase II, which includes restorative exterior work on the building façade including replacement of all windows & doors, will be completed during 2018. A new interior stairwell will also be included within the rear of the center. During demolition work at the site, a historic stairwell was uncovered. In order to meet new code requirements, architects aided in designing a new staircase for the space. Phase III, which includes the restoration of the 2nd story & the development of 3 apartments above the retail and meeting space is slated for 2019. There are 5 phases in total planned for the Spencer Pride commUnity center project. The commUnity center is now formally finished with Phase I, although many details throughout the space are still being finalized. The new building solidifies the presence of Spencer Pride in the community. The organization has been active in Owen County since its establishment more than a decade ago. Over the course of that time, the organization has evolved in many ways. The opening of the commUnity center was a major milestone when it originally opened in September of 2016 in a rented space on the south side of the courthouse square. After their volunteer base doubled and support for the retail store was apparent, plans were assembled to purchase a building downtown that would better serve the organization’s long-term needs. Volunteers stopped for a moment during the moving day on January 28, 2018. The new space will be utilized for multiple purposes. It includes an expanded retail space. Unity, the retail shop of Spencer Pride, will continue to feature unique items created by local artisans as well as an assortment of vintage resale merchandise. The center now also includes an informal Gathering Place for community members to come to relax, read a book, work on projects, and more. The new location also has a meeting room that is now available for free to other local not-for-profit, LGBTQ+ affirming organizations. Amenities such as two ADA-compliant public restrooms with changing tables are also now available to the public, as well as free Wi-Fi. Eventually additional services will be offered as the center evolves. Spencer Pride organizers thank the many individuals who volunteered to make this dream a reality as well as the individuals and organizations who have made donations to help the project. Spencer Pride has established a foundation and a capital campaign at the Owen County Community Foundation where the funds are being managed. For more information about Spencer Pride visit www.SpencerPride.org or stop in to the commUnity center Wednesday through Saturday from 10 AM until 7 PM. Jonathan Balash can be reached via e-mail at Jonathan@SpencerPride.org. The amount of work undertaken in the past 2 months to transform our new facility into the new home for our commUnity center cannot be overstated. Masonry, electrical, framing, plumbing, flooring, lighting, painting, demolition, & cleaning have all been utilized in order to prepare the space for our upcoming move. Countless individuals have been involved in the project including volunteers as well as paid local contractors. Pictured here are a few photos from throughout the past 60 days. You’ll see various stages of our work as well as many of the people who have been involved. Future updates will include additional photos. Volunteers work on removal of plaster in the future Gathering Place during December 2017. As previously communicated, the short-term plan (phase 1) is to move all of our existing operations from our rented facility at 46 E. Market Street to our newly purchased building at 17 E. Franklin Street. This move will encompass transition of Unity (our retail store), Safe Place services, & all other elements of our current commUnity center by the end of January. Once this transition is complete, the new facility will boast everything we currently offer & much more. Newly added amenities at the new facility will be two ADA-compliant restrooms, an informal Gathering Place, & meeting room. Volunteers are at the new facility daily in preparation for the completion of this phase. Most weekends consists of 1 or more workdays where up to a dozen volunteers are assisting in the many things that need to be done. Long-term plans include complete restoration of the exterior & renovation of the 2nd floor. Once complete, the 2nd floor will contain 3 rental units intended for elder & other members of the LGBTQ+ community. It will also have office space that will be utilized to offer a variety of new or low-cost services for the community. As plans are developed further they will be communicated to the public. If you are interested in helping out in January with this effort, please contact Marissa Mallo, our volunteer coordinator. You can reach Marissa via e-mail at Marissa@SpencerPride.org. Truman, one of our prized volunteers, was eager to help out with the floors. This post was written by Jonathan Balash, Spencer Pride’s president. Jonathan can be reached at Jonathan@SpencerPride.org and 812-821-3073. Imagine a small, rural community with a thriving LGBTQ+ community center operating out of a building originally constructed less than 20 years after the end of the Civil War. Imagine the center regularly filled with people from all walks of life, utilizing the facility in many different ways: Members of the LGBTQ+ community & others are engaging with an all-volunteer staff to access important support services. Individuals & small groups are taking advantage of public computers & free Wi-Fi in a comfortable, informal gathering place. Local, LGBTQ+ affirming not-for-profits are regularly utilizing free meeting space to do their important work. Patrons are shopping at a store which sells items made only by local artists & craftspeople. Upstairs, members of the aging LGBTQ+ community are utilizing affordable housing with a spectacular view of a revitalized downtown district. Throughout the facility, everyone feels safe, welcomed, & supported. Imagine these things & much more. Here we are. We are Spencer Pride in rural Spencer, Indiana. Population 2,214. We are restoring & improving the historic I.O.R.M. building located in the heart of our downtown. Visit the building & you’ll find us working to create a full-fledged LGBTQ center that will allow that vision to come to fruition. We have been working in our community for the past 11 years & have established a reputation of professionalism, service, & a commitment to the betterment of our community. For the past year we have been operating a successful LGBTQ+ center in a small, rented space on the courthouse square, across the way from our newly purchased building. We’ve shown our capability to thrive in our community, all while working towards our mission of making Indiana a more welcoming place for ALL people. As we approach the end of 2017, I am proud to be able to share with you a taste of what we are doing in the new building to prepare it for its future use. Many of you have been asking for this information. Countless others still don’t know that we have even begun this journey. Regardless of which group you fit in, hopefully you will find this update informative. If it also inspires you to open up your checkbook & make a financial contribution to our efforts, we would welcome that (more details below)! Over the past 30 days we selected (after seeking multiple bids) a local architecture firm who is completing a feasibility study of our building. This study will establish the ‘current state’ of the building & highlight areas for improvement. The study will also develop a preliminary site master plan on the future utilization of the entire building, based upon our communicated programming needs. Springpoint Architects will be finished with the feasibility study in Q1 of 2018. They are a firm experienced in historical restoration. We received a $2,500 grant from Indiana Landmarks to assist with the cost of the feasibility study. What are the factors keeping us from making our vision a reality today? Financing. Our volunteers have the passion, energy, & dedication. Our organization has both the imagination & the capability. While we are a successful not-for-profit, our goal has never been to focus on revenue – but rather – our work. Our existing revenue streams support our current work. In order to ensure the continued fiscal strength of our organization, therefore, we cannot rely on our present funding to transform our new community center. Instead, we will be seeking grants, individual contributions, & organizational partners. Can you help on this #GivingTuesday? Every dollar brings us closer to our goals. With your support, we will create a facility where everyone can gather, learn, shop, support, & imagine, all while helping us accomplish our mission of making Indiana a more welcoming place for all people. Spencer Pride is a 501(c)3 not-for-profit organization & your donations may be tax deductible. To make a contribution, visit www.SpencerPride.org (just click the donate button on the top of the home page) or contact Judi Epp or I. We can provide you a private tour of the facility & show you what we can accomplish together. We can also talk about the benefits of becoming a sponsor, if you are interested in learning more about those opportunities. We know what needs to be done & we WILL get it accomplished. You can help make it happen sooner rather than later. On Sunday, April 2, nearly 15 Spencer Pride volunteers spent the day doing some really nasty work at the commUnity center. They hammered, sawed, pried, & shoveled to clean the old paneling, plaster, & other surfaces off of the 130-year old brick walls in the back of the center. This effort was undertaken to help further prepare the space (hopefully for the upcoming installation of air conditioning) & to continue our effort to restore & beautify our building. This was a disgusting job, but our dedicated volunteers went all-in. They donned appropriate safety gear, tools, & set to work on the task. Our original goal was to expose as much of the walls in the back room that we were able to do. In the end, ALL of the walls were completely cleared. Volunteers also removed one wall entirely near the back of the center & cleaned up some of the mess out back. We always say that we have amazing volunteers. This is just one more example of their passion & dedication. Being paid with nothing but donuts, home-made cinnamon rolls, & pizza, our resilient crew knocked down our expectations! This week, it was announced that the Town of Spencer would be receiving a Main Street Revitalization Program grant through the federal Community Development Block Grant Program. This grant awards $500,000 for downtown streetscape improvements on parts of Main Street & Market Street. The grant money will be combined with a local match of $598,000 in order to fund the expected total cost of the project, which is estimated to be $1.1 million. Spencer Pride is excited to see this improvements, especially those that will have a direct impact on the commUnity center at 46 E. Market Street. Spencer Main Street played a pivotal role in acquiring this grant. Volunteers of Spencer Pride, including Unity retail manager Jacob Balash, are also involved with the Spencer Main Street Association. Spencer Pride treasurer Judith Epp expressed gratitude to the Town of Spencer, Spencer Main Street, & the State of Indiana for supporting the downtown improvements. The downtown work is expected to take place in 2017, likely lasting 3-5 months. It is possible that this work will be underway during the Spencer Pride Festival on June 4. The Spencer Pride commUnity center will see significant improvements out front once the work is completed in 2017. The Spencer Coloring Book is now available at the Spencer Pride commUnity center. This is a wonderful gift for all ages, featuring nearly 60 local sites drawn by local artists Primo Corona & Susan Shorter. The book is available for $9.99 or our special promotion Buy 5, Get 1 Free. 100% of the proceeds of this book go to support the mission of Spencer Pride, Inc.
Stop by the commUnity center on Fridays at Saturdays between 10 am and 7 pm to pick up one for everyone on your wish list! This past weekend, the Spencer Pride commUnity center and its shop, Unity, officially opened it’s doors to the public. The Grand Opening celebration was intentionally timed to coincide with the annual Apple Butter Festival in Spencer. The official ribbon-cutting ceremony, coordinated by the Owen County Chamber of Commerce, took place at 9 AM on Saturday. Although it had been raining all morning, the sky cleared in perfect time for the ceremony, which was very well attended by the public. Most of the Spencer Pride Board of Directors was in attendance, as was many of our loyal volunteers. The Owen County Chamber of Commerce presented Spencer Pride president Jonathan Balash with a plaque to commemorate the event and to recognize the 10 years of service that Spencer Pride has provided to the community. Immediately following the ribbon-cutting, excited attendees flooded into the center to explore the many fantastic items for sale and to learn about our new facility. The CommUnity Center remained quite crowded throughout the entire day. 5-8 Spencer Pride volunteers were present at all times. Thankfully, we have so many dedicated volunteers that most people were able to take shifts of 3-4 hours in length. On Sunday the day started and finished rather slow, but this was not unexpected. Based on our experiences at the Apple Butter Festival in the past, Sunday is typically a low traffic day. That being said, we were quite busy mid-day. Overall, we had nearly triple the number of attendees that we expected. We also exceeded our sales expectations. Individuals in attendance couldn’t stop complimenting our space and thanking us for what we have done for our community. We are absolutely thrilled and grateful to our community for having embraced the opening of our commUnity center with such passion and excitement. Another shop is about to arrive on the square in downtown Spencer. Unity is a distinctive retail store located within the Spencer Pride CommUnity Center at 46 E. Market Street, right across from the Owen County Courthouse & just a few buildings down from the newly relocated Sweet Owen Visitors Center. The historic building that houses Unity, which is over 125 years old, serves as the perfect environment for the establishment. The interior design of the space evokes a strong sense of the past, yet will appeal to the most modern of sensibilities. Products are displayed in both century old displays as well as modern glass cabinets. At Unity, visitors can expect to find unique gifts for friends & family – & for themselves, too! Merchandise is all high-quality & locally-produced. Featured items include jewelry, art, stained glass, hand-made fashion accessories, pottery, & much more. 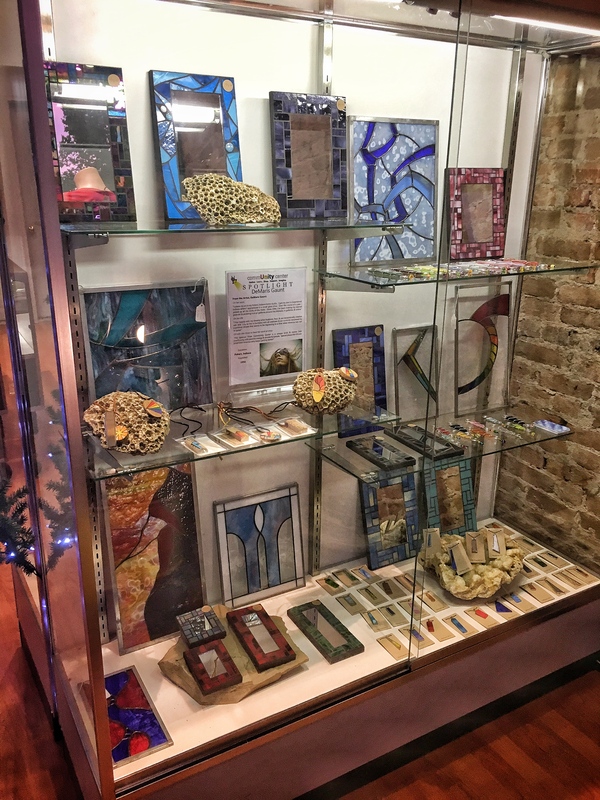 “Spotlights” – biographical signage that features the artist/craftsman involved with the items on display – are prominently posted in each display to help connect potential customers with the individuals that produced the products. “We want everyone to know who is making the products, why & how the artist became involved in their craft, & why they’ve chosen to sell their products here,” said Jacob Balash, Unity’s retail manager & longtime Spencer Pride volunteer. Although there will certainly be many consistent product themes at the store, the inventory will be constantly evolving. Many of the items for sale are one-of-a-kind or are available in very limited supply. The unpredictability of the merchandise will keep Unity an exciting place to visit. Even individuals who aren’t looking to make a purchase will still appreciate the fine craftsmanship of the products on display. Each purchase at Unity supports local artists & craftsmen. Profits all support the educational mission of Spencer Pride. Balash is one of many volunteers who have spent a significant amount of time preparing Unity and the entire Spencer Pride CommUnity Center for its upcoming debut to the public. In fact, all of the work that Spencer Pride does is done entirely through volunteerism – Unity is no exception to that. Debbie Messer, local resident and volunteer at Unity, is excited about her work with the organization. “I’m relatively new to the Spencer community and have found my forever family in Spencer Pride!” Messer said enthusiastically. She has been a part of the committee focused on getting Unity up and running in time for the annual Apple Butter Festival in downtown Spencer. Preparing a new store & center has not been easy, but volunteers are confident that their efforts are helping Spencer Pride achieve its mission. 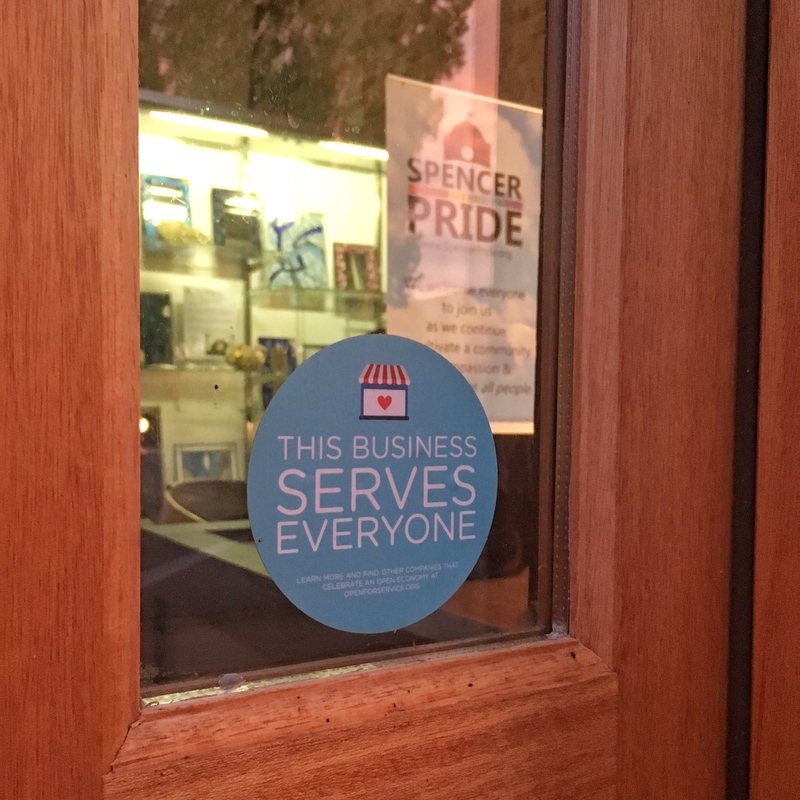 Spencer Pride, Inc., is a 501(c)(3) not-for-profit organization focused on educating the public about the rural LGBTQI community in order to make Indiana a more welcoming place for all people. The organization educates through direct engagement with the public. Spencer Pride consists of more than 30 active volunteers who have a deep passion for community betterment. Many more volunteers assist with the various events and activities coordinated by the organization throughout the year. Dana Beth Evans, Director of the Monroe County History Center, has also been heavily involved in crafting the operational strategy for the new store. .
“I can’t tell you how please I am to be a part of this organization,” she stated. Evans is on the Spencer Pride Board of Directors and served as the Director of the Tivoli Theatre from 2013 until 2015. Greg Bukowski has also volunteered with Spencer Pride and has had a role in establishing Unity as well. “What I love about this store and organization is that it’s so much more than the LGBT community. It’s about all communities and uniting them together in an exciting way. That’s why we chose Unity as the name,” Bukowski said. The Spencer Pride CommUnity Center & Unity shop Grand Opening Event will take place on Saturday, September 17th, from 9 AM until 6 PM & on Sunday, September 18th, from 9 AM until 3 PM. Regular operating hours for the store (effective September 23rd) will be Fridays & Saturdays from 10 AM until 7 PM. For more information about the work of Spencer Pride, please visit www.SpencerPride.org or check them out on Facebook at www.Facebook.com/SpencerPrideInc.